On my everyday jeepney ride on going home, it was always a silent ride. My co-passengers had been employees like me and some are students who had been exhausted for the whole day that passed by. 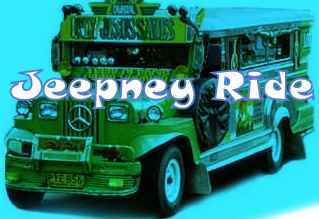 Common scenario with this ride is the mellow radio music inside the jeepney while most of the passengers are past asleep. Seeing these things make me remember my essay writing when I was in college. I don't know why I chosen jeepney ride as the topic in my essay instead of other interesting topics to write about. My teacher wrote some comments in my write-up and one of the things she mentioned is that how could I relate to some passengers when in the first place there had been no exchange of words or interaction inside the jeepney. According to my teacher most co-passengers are just passers-by in one's life of a jeepney passenger that it would not be possible to learn something in a jeepney ride. I was not been able to have a good mark in that essay. If only I was able to discover www.911essay.com that could surely help me in my essay problems. To prove my teacher wrong I was able to have this blog but in every silent ride I have, it made me thinks twice that maybe my teacher had been right.